Denver Broncos linebacker Von Miller caught a hammerhead shark while fishing in Florida, and posted pictures on social media. Miller is well known, not only for being Super Bowl MVP, but he has also done a lot of commercials and even appeared on Dancing with the Stars. Now he’s in hot water as there may be an investigation since hammerheads are a protected species. The video, embedded in the TMZ article, shows that the shark was released alive, but it also shows the shark was bleeding on the boat, and distressed when returned to the water. I don’t think Miller is in the wrong here, as he has video showing the shark’s release. FWC will still conduct an investigation, but it won’t need to be too intensive. It appears he is on a fishing charter. It’s incumbent on the captain to ensure that the animals are treated humanely by everyone on board, and returned safely. Miller could be facing misdemeanor criminal charges. I don’t see any charges for Viller, and hopefully, the shark was ok. Working to be your leading Alligator-law related blog, we bring you this story from the FWC. FWC officers stopped a man driving a truck through a wildlife management area to check for his day-use pass, only to find dismembered alligator parts stashed around his vehicle. Upon questioning, the man admitted he had recently killed the alligator without permission. Alligators can now be legally hunted in Florida, like deer and other animals, but alligator hunts are closely regulated. Know your laws before you hunt… or fish: Florida takes wildlife management seriously. And be sure of what you’re doing. Don’t be like Bryan Rohm. He was out hunting an alligator with his son (legally!) and thought he had killed it. He was sorely mistaken, and when he brought it in the boat, the alligator bit his thumb and jumped back into the water. He had shot the gator twice with the bang-stick, an alligator hunting device (basically it delivers a shotgun blast at point blank range), and wasn’t able to stop the thing. Alligators are badasses. 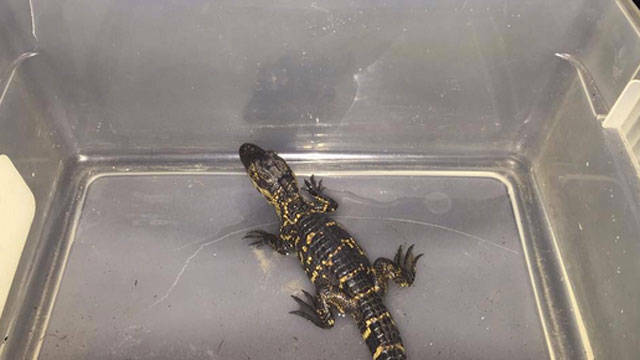 A couple of unnamed Cape residents saw a baby Alligator wandering in an intersection on Halloween night, and decided to rescue the little guy. It’s clearly a baby, as it is only a foot long, and still has its baby spots, which fade after a few years. The Samaritans scooped up the little guy, only to be stopped by CCPD before they could find a safe place to release it. 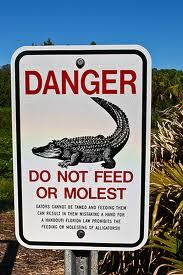 It’s a crime to possess an Alligator in Florida! Fortunately, Officer Pinkham was sympathetic, and called in FWC to safely relocate the little guy, without charging the Samaritans. Yay, rescued gator! If you see a Gator in distress, or being a threat or nuisance, it is incumbent to call FWC, at 866-FWC-GATOR (866-392-4286).